The Port for Sanya, is a new and modern setup. It sets out on Phoenix Island, which is a peninsula from the mainland. It is possible to walk (10 minutes) to town from the Pier, but it really depends on how much walking you want to do. Larger ships will use tenders to get you to the terminal. Visa free shuttles available $25 pp. but not really needed if you have a multiple entry visa. Instead, at the cruise terminal visitors can buy a “electric car” ticket for 5 yuan each way, which will drop you off downtown near a department store and Kentucky Fried Chicken. At dusk, the Phoenix island towers will surprise you with a free light show. Those towers will show the map of the world, descending parachutes and parasails, and all kinds of intriguing patterns. It was a nice fireworks display of lights.. Expansion plans ar under way: Completed in 2016, PIICT is able to berth five ships at the same time. This is part of a larger Phoenix Island development which will cost over 18b RMB including a man-made island, a seven-star hotel and an international conference center. Billed as "China's Hawaii", Sanya has 20km long stretches of beach. As the only tropical city across the coastline, it is definitely booming and packed with a lot of water sports such as snorkeling and jet-skiing, rainforest hiking, and innumerable hotels ranging from zero to five stars. You wouldn't go all the way to China for beaches, but you'll find them - and spectacular ones at that - in the shoreside city of Sanya. Located on a peninsula at the southernmost tip of Hainan Island, Sanya boasts a dazzling white-sand shoreline, bright-blue surf and a colorful underwater world. The visibility of Sanya's South Sea waters and its protected coral reef accounts for its growing popularity as a dive site. Besides its obvious natural beauty, the silvery beach at Tianya Haijiao is best known for the engraved rocks that sit along its coast, one of which graces the back of the RMB 2 note. According to legend, the rocks form "the edge of the sky and the end of the sea" where Song dynasty officials were exiled in the late 13th century. The bus traffic in this city is very convenient for a small city. There are buses to almost every county and tourist attraction. The main route is from Dadonghai to Civil Aviation Stop with the ticket fee ranging from CNY1-4 in accordance with the destinations you are bound for. No. 2 and No. 4 can take you to Dadonghai via the Main Bus Station and the First Market with a fare of CNY1. No. 104 can take you to Tianya Haijiao, Nanshan, and Ancient Yazhou City. The fare for a complete circuit is CNY6. 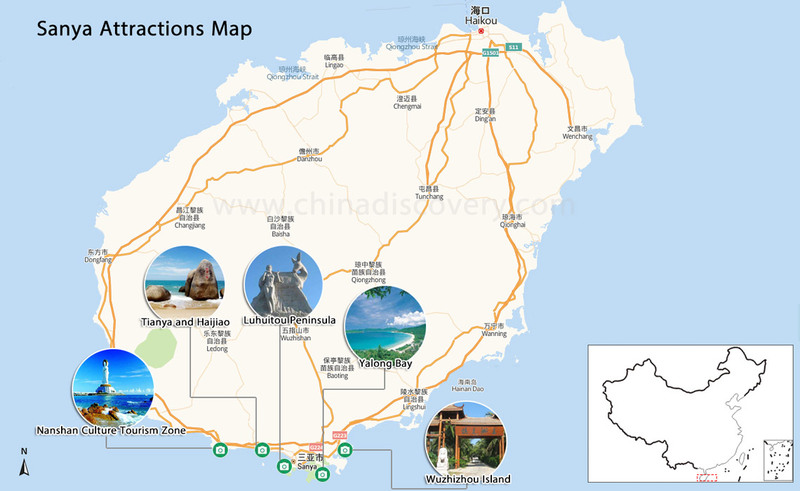 Tourist mini buses start from Western Bus Station and head towards Asian Dragon Bay, Tianya Haijiao, and Nanshan, etc. Taihe Bus will take you to Asian Dragon Bay via Dadonghai and Tiandu every 30 minutes. Buses to Tianya Haijiao and Nanshan run every 15 minutes and charge CNY4 per person. In addition, you can also take double-decker sightseeing buses to some attractions. These buses depart every 10 minutes from Asian Dragon Bay at about 07:15 via Dadonghai, Sanya Bay and Hawksbill Island to Tianya Haijiao. The latest return run to Asian Dragon Bay is about 19:00. The tourist special bus will take you about 70 minutes for the whole journey. The fare from Asian Dragon Bay to Tianya Haijiao is CNY8. Traveling by taxi is also a good way to get around as it is convenient and inexpensive. The starting fare is CNY8 within two kilometers and CNY2 per additional kilometer. It is a very good idea to confirm the fare with the taxi driver in advance when traveling to different places. Naturally, the best eats in Sanya come straight from the sea, although Hainan, Hunan, Sichuan, Yunan and Guizhou cuisine are all readily available here too. As far as seafood goes, the more exotic the better (sea cucumber, anyone?). The food stalls around Sanya harbor offer an array of fresh ingredients, cooked to order. Behind the newfangled, touristy facade of the Sanya shoreline is a pleasant town with streets and streets of small stores. Unlike Hong Kong, no one is trying to sell anything. The area produces pearls in abundance and they are sold everywhere.Prices are highly negotiable; overcharging tourists is common.Tour guides get a fat (often 50%!) commission for bringing touriststo pearl shops; try to go without one and beat the price down. The Yuan (or Renminbi RMB). Occasionally you will be given a counterfeit bill, mostly in a small denomination. Nothing you can do about it, just keep it as a souvenir. Internet is very well adapted in China, in fact even the more modest hotels have almost all WiFi in their rooms and in the public areas you will find Internet stations. Often for free or at a very modest charge.